1 Now the LORD spoke to Moses, saying, 2 "Tell the sons of Israel to turn back and camp before Pi-hahiroth, between Migdol and the sea; you shall camp in front of Baal-zephon, opposite it, by the sea. 3 "For Pharaoh will say of the sons of Israel, 'They are wandering aimlessly in the land; the wilderness has shut them in. 4 "Thus I will harden Pharaoh's heart, and he will chase after them; and I will be honored through Pharaoh and all his army, and the Egyptians will know that I am the LORD." And they did so. 5 When the king of Egypt was told that the people had fled, Pharaoh and his servants had a change of heart toward the people, and they said, "What is this we have done, that we have let Israel go from serving us?" 6 So he made his chariot ready and took his people with him; 7 and he took six hundred select chariots, and all the other chariots of Egypt with officers over all of them. 8 The LORD hardened the heart of Pharaoh, king of Egypt, and he chased after the sons of Israel as the sons of Israel were going out boldly. 9 Then the Egyptians chased after them with all the horses and chariots of Pharaoh, his horsemen and his army, and they overtook them camping by the sea, beside Pi-hahiroth, in front of Baal-zephon. 10 As Pharaoh drew near, the sons of Israel looked, and behold, the Egyptians were marching after them, and they became very frightened; so the sons of Israel cried out to the LORD. 11 Then they said to Moses, "Is it because there were no graves in Egypt that you have taken us away to die in the wilderness? Why have you dealt with us in this way, bringing us out of Egypt? 12 "Is this not the word that we spoke to you in Egypt, saying, 'Leave us alone that we may serve the Egyptians'? For it would have been better for us to serve the Egyptians than to die in the wilderness." The Sea Is Divided. 13 But Moses said to the people, "Do not fear! Stand by and see the salvation of the LORD which He will accomplish for you today; for the Egyptians whom you have seen today, you will never see them again forever. 14 "The LORD will fight for you while you keep silent." 15 Then the LORD said to Moses, "Why are you crying out to Me? Tell the sons of Israel to go forward. 16 "As for you, lift up your staff and stretch out your hand over the sea and divide it, and the sons of Israel shall go through the midst of the sea on dry land. 17 "As for Me, behold, I will harden the hearts of the Egyptians so that they will go in after them; and I will be honored through Pharaoh and all his army, through his chariots and his horsemen. 18 "Then the Egyptians will know that I am the LORD, when I am honored through Pharaoh, through his chariots and his horsemen." 19 The angel of God, who had been going before the camp of Israel, moved and went behind them; and the pillar of cloud moved from before them and stood behind them. 20 So it came between the camp of Egypt and the camp of Israel; and there was the cloud along with the darkness, yet it gave light at night. Thus the one did not come near the other all night. 21 Then Moses stretched out his hand over the sea; and the LORD swept the sea back by a strong east wind all night and turned the sea into dry land, so the waters were divided. 22 The sons of Israel went through the midst of the sea on the dry land, and the waters were like a wall to them on their right hand and on their left. Man thinks like this: to surround you with God’s word, receive it and follow the Lord – is dangerous, it results in enormous consequences and costs. And that is also more than true, than what a worldly human being can understand – it will cost us the old man in us, what the Scripture talks about as the flesh – its life! You can also hear the people of Israel here: ”Why have you dealt with us in this way, bringing us out of Egypt?.... For it would have been better for us to serve the Egyptians than to die in the wilderness!" (v.11-12). You see, they looked at what could save their lives, and that was to serve the Egyptians! – To follow the Lord would be to end up in death in the wilderness. Many, who have started on the way to heaven, can come across that thought: Oh how good it would be to just carry on with the world, eat everything it has to offer, and not have to deal with the hassle of the consequences of a Christian confession! – That is often almost like death itself. You know this constant fight within you, between flesh and spirit, which the Scripture speaks about, the totally state of dependence on Jesus, just to pass. – And if you really live with Him, you constantly meet this contempt and mockery from the world, to become less attractive, and not to be counted with the popular group, to stand last in line and so on. – It’s not good for the career to have a clear Christian confession. And there are many who wants to return to “Egypt,” if not completely, just to get on their good side. That is a dangerous thought for a Christian, for the world will not be reconciled with you, without you giving it something! The Egyptians could never get on the good side of the people of Israel as long as they were walking straight towards the land of Canaan – no, they were after them, to lead them back to Egypt! – Back to the service in Egypt! The world either can or will accept you, as long as you confess yourself as one who is on the way to heaven – because it contains also a judgment over the world. When I confess to be a Christian, I also - by that - pass judgment on this world at the same time. – I say then that this world don’t have or can give me what I really need – there is not anything here that can save me, on the contrary, the worlds image perishes – not even the best of what it can offer of spirituality and religiosity is enough – I believe in salvation in Jesus Christ alone! A confession like that will always cost you, also here in Norway! The fact is that we have a wrong view about this, as long as we are not enlightened by The Holy Spirit! It’s not receiving the Word of God that’s dangerous for us, but to stand against it! Shall I dare to receive the Word of God? One should rather ask this: Do you dare not to? Yes, do you dare to walk as much as a step further? – Do you dare to let the time go minute after minute, without being convinced that your case with God is in order? God’s Word shows this so clearly – the one walks with God’s protection, and an open heaven over himself – the other one walks unprotected against all danger around him, and God’s wrath over himself! If one walks with God, one isn’t necessarily protected against all accidents that can hit you in this world – no, not even against physical death – but against that which will tear you away from the opened heaven, and the goal for the walk. It’s like with Israel and Egypt here in this passage. The people of Israel had walked out from Egypt based on the Word of God – in reality there were only a few of them who had done that, most of them had just let themselves be led out – but nevertheless, God’s blessings was over this people for the sake of the few believers and His promise to their fathers– and then there were a lot of those who wanted to return to the country and the people who had God’s judgment and curse over themselves! Haven’t you read what the Scripture teaches about the world? We can see here the terrible result of standing against the Word of God: “Thus I will harden Pharaoh's heart!” (v.4a). It was also one in the flock of Jesus disciples who stood against His word, and did not receive it or bow down for it – and then we read about Judas: “And Satan entered into Judas!” (Luk.22:3, Joh.13:27). It is the hardening – the end of standing against the Word of God. Pharaoh had to then do what Satan wanted him to do, and that always ends with death. – He is the prince of death, and has therefore nothing else to give then death! That’s the way it ended with Judas too! But for you who experience the struggle as a Christian, who has to cry for Jesus, over yourself – your sin and failure, maybe hostile surroundings because you want to follow Him, need for the unsaved in your family, all the frightening that you see in the world around you today and so on. – Listen to what it says here, listen to what He says to His servant Moses: “The LORD will fight for you while you keep silent." (v.14). And then you see how God has compassion over them, and cares for them: “The angel of God, who had been going before the camp of Israel, moved and went behind them; and the pillar of cloud moved from before them and stood behind them. So it came between the camp of Egypt and the camp of Israel; and there was the cloud along with the darkness, yet it gave light at night. Thus the one did not come near the other all night.” (v.19-20). And then He leads them to the rescue, on a road no one would have imagined – that was what made Pharaoh hurry to go after them, we read – he thought they had gotten lost in the wilderness! So, the Lord’s way appeared to them as a delusion! It can soon look like that for you too, if you start to use your own thoughts on it. We are called to follow Him, to trust Him! – Then we will also see that He has a way where there is no way. Look at Pharaoh and his army who fumbles back there blindly, and doesn’t know that what hinders their view is the Lord’s angel. (v.19-20). But Israel walked on dry shoes through the ocean! – And you and me, we become worried maybe, just because a poor politician wants to do it hard for the Christians in this country. Listen to this question from the Lord here: “Who are you that you are afraid of man who dies And of the son of man who is made like grass,” (Is.51:12). What was the rescue for the people of Israel? – What did God lead them through? – Yes, the Red sea! The blood! – Jesus Christ’s precious blood that is the ocean He has thrown – and drown all our sin into! This ocean can no man walk through – it’s like the Egyptians, it becomes their death. For Israel it was opened and they were led through! That’s how it must be for us too – it must be revealed to us, where the road goes! 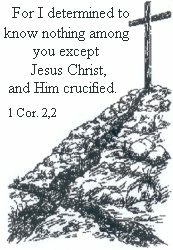 : The value of Jesus Christ’s blood, of the work of Jesus Christ, by what God is reconciled with all men – also with you! But as long as you don’t see this, it will not help you! You become lost even if everything was done – everything was finished, to use Jesus own words. You must hear the word about Jesus, the word of the cross, the word of the blood, the costly price who alone has opened a closed Paradise. As God would save Israel from the slavery in Egypt and lead them to the promise land Canaan that is the way He wants to save us. And He came Himself to lead us out! So let us hear the Word also to us, when it comes to our salvation: “The LORD will fight for you while you keep silent." (v.14).